Here's another something that looks like, but is not, a souvenir card. Rod will appreciate these. 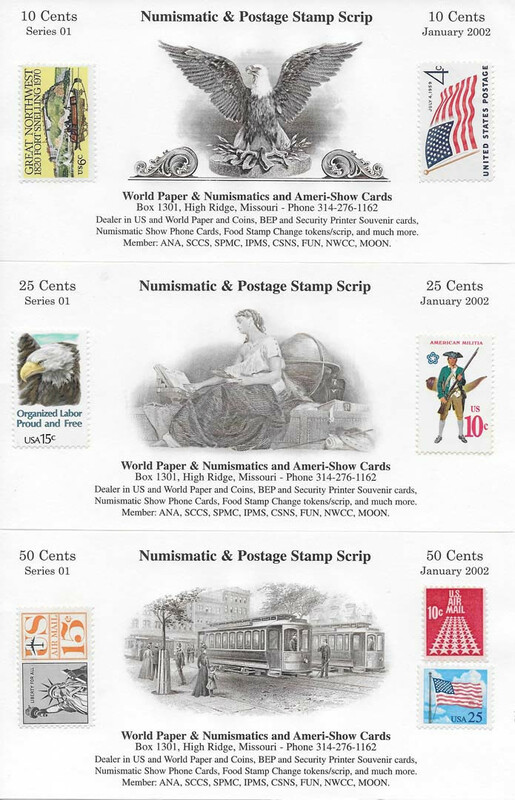 Back in 2002, dealer Lee Quast had Mike Bean print up some small cards to which he affixed postage stamps and circulated as scrip at the FUN show and other shows he attended. They aren't specifically souvenirs of any show in particular -- more of an advert for Lee -- so we didn't list them in the SCCS catalog. But they do share engraved vignettes with numerous other souvenir cards that Mike printed. Such a nice guy doing bad things.... Now I want some of those...what the?? It's possible Lee might still have some of these in stock. I'll PM you his email.